Comptonia peregrina.Kitty Kohout.Robert W. Freckmann Herbarium University of Wisconsin at Stevens Point.wisplants.uwisp.edu (Accessed 5/2014). Comptonia peregrina is a shrub 0.3-1.5 m tall, aromatic, much branched, new growth hairy; colonial from rhizomes; stipules present. Leaves alternate, stalk very short, blade linear to narrowly elliptic, 5-15 cm long, 1-1.8 cm wide, margin deeply, pinnately blunt-lobed, upper surface dark green, pale below. Flowers inconspicuous, in catkins, sexes on different plants (dioecious); male flowers with 2-4 stamens in clusters of olive-green cylindrical catkins, to 3.5 cm long, 0.6 cm wide among numerous egg-shaped, sticky-hairy bracts 0.3 cm wide, on stem tips of previous years stems; female catkins red rounded to 0.7 cm long, flowers covered by small bracts (Radford et al. 1968); wind pollinated; blooms April-June, before leaves appear. Fruit female catkin becoming bur-like, 1-2 cm wide in fruit composed of linear bracts surrounding seed-like nutlets 0.4-0.5 cm long; fruit matures Sept.-Oct. Frequency in NYC: Very infrequent. Although sometimes planted in restorations or horticulturally. Habitat: Dry, open areas, shrubby growth on sandy, or gravelly, acid soil, pH 4-7; intolerant of shade, salt or saturated soil. 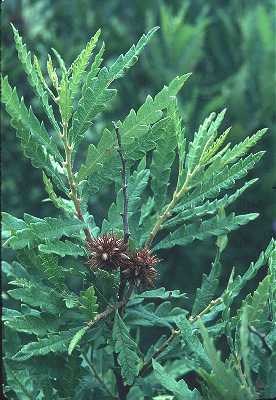 Regenerates well from rhizomes after burning (USDA, NRCS 2006). Notes: Stems and foliage are eaten by rabbits and deer (Martin et al. 1951). Roots form a symbiotic relationship with an actinomycete bacterium of the genus Frankia forming nitrogen fixing root nodules (actinorhizae). These structures appear coral-like in form and allow sweet fern to grow in very nutrient poor soils (Sinclair et al. 1987). Leaves contain a number of aromatic compounds including cineole, terpinene, myrcene, and linalool. Infected several fungi including: Botryosphaeria dothidea (Ascomycotina, Pyrenomycetes) which attacks stressed or wounded plants causing cankers or death of stems; the rust, Gymnosporangium ellisii (Basidiomycotina) uses sweetfern as an alternative host to juniper and causes leaf spots and possibly death; Cronartium comptoniae which grows thread-like horns on leaf undersurfaces but apparently does not harm the host plant (Hall et al. 1976; Sinclair et al. 1987; Agrios 1988).